South Africa's gold-mining industry is in crisis, with 80.000 miners walking out on strike and the government virtually admitting it is helpless. Mining is a crucial cornerstone of the South African economy and estimates suggest that the strike is costing the country around £22 million a day. There are echoes of the 80s miners' strike in the UK, with the miners' unions and mine owners at loggerheads and the looming threat of police violence. Most miners are demanding wage rises of 60 percent to compensate for harsh working conditions in the mines and accuse bosses of paying "slave wages". A more radical group is pressing for 150 percent rises. The union has challenged the government to intervene in the standoff, while accusing mine owners of maintaining a situation that was created by apartheid South Africa. 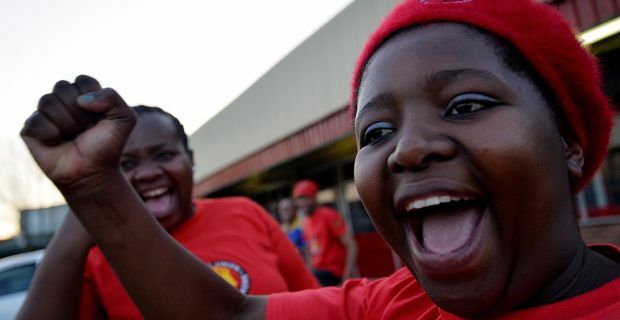 "The NUM has noted government's wishes that industrial action be avoided and dares the state to explain which side it is on," the union spokesperson Lesiba Seshoka said. "The union is aware of the devastating impact industrial action would have on the economy, which is largely a white man's economy with no benefits for poor black mineworkers." South Africa is facing a serious economic crisis, exacerbated by strikes in the car manufacturing and construction industries. The ANC government of Jacob Zuma is struggling to maintain credibility. "Government can only appeal to parties to find a solution," Zuma said. "I don't think we can tell the management of the mine 'accept what the workers are saying', nor can we tell the workers. The strike hurts both sides. Both sides must be ready to give and to take as well." Compromise looks unlikely given the history of violent suppression of strikes. The 2012 massacre of 34 striking miners at Marikana by police officers looms large over the conflict, with miners understandably slow to trust the company bosses.